Big crochet hooks & thin yarn will give you a stretching finish, while a small hook with thick yarn will give you a harder more stable finish. How there is a typical or standard suggested crochet hook for each yarn weight (Free downloadable cheat sheet). How to choose crochet hook & yarn weight to get your desired result. There is sort of a typical or standard way to define what crochet hook you should use for a given yarn weight. This will give you the “normal” result, as I would call it. 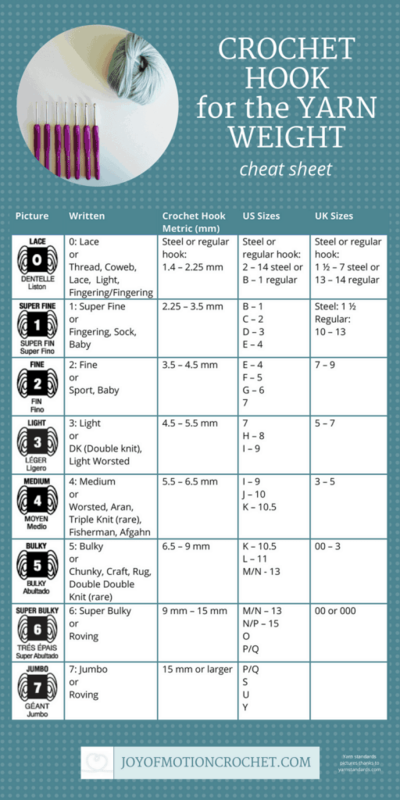 I’ve made a easy chart for this for you to see, however I hope you read further to get the chance to understand in more depth how you can play around with choosing crochet hooks for the yarn weight. 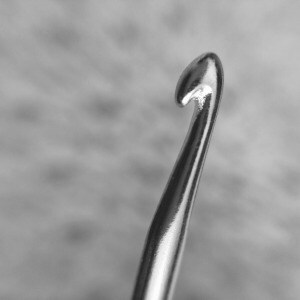 I’ve gathered the best information that will guide you through choosing the best crochet hook for the yarn weight you’ve got. It’s divided into these steps. Another factor to consider – Yarn fiber. 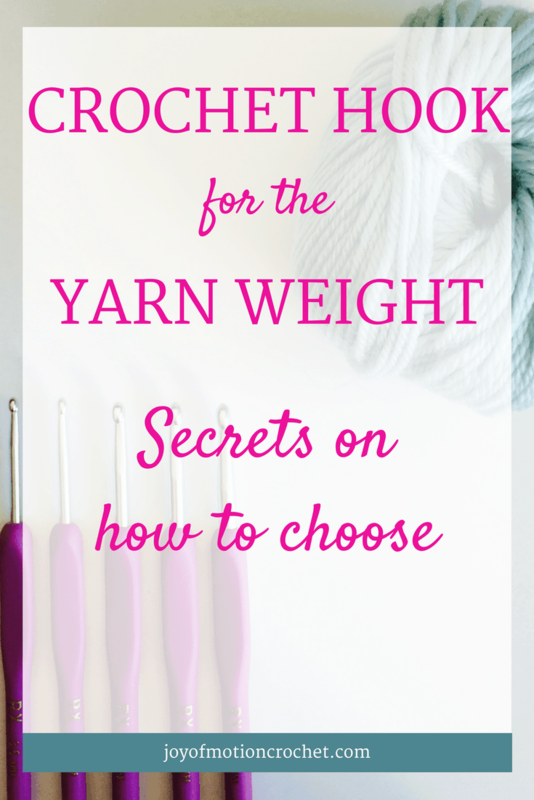 STEP 1: WHAT YARN WEIGHT DO YOU HAVE? The first step for finding the result you’re looking for, is understanding what yarn weight the yarn you’ve got in mind is. This is really the most important factor when choosing the crochet hook for your project. Yarn weight (read more about this here). Suggested knitting needles or crochet hooks (see chart above or download). What type of fiber the yarn contains. The length describes how long the yarn is, something that your crochet pattern also might give you the information about. If you decide to change your yarn to another than suggested in the pattern this information will be important. But you don’t necessarily need that information, the yarn weight and the weight of the skein might be enough in mots cases. If you have a type of yarn with the same yarn weight & enough skeins you can easily change the yarn. However test it against the crochet patterns gauge (ease) first. Then lastly, the crochet hook & knitting needle suggestions. These are included as a suggestion & can be handy as a reference. However I will always suggest that you use your crochet pattern suggestions in comparison to yarn and gauge when you start crocheting. If you however are making something without a pattern, use the suggested needles to make a finish that is neither to hard and tight or too loose and widens a lot. 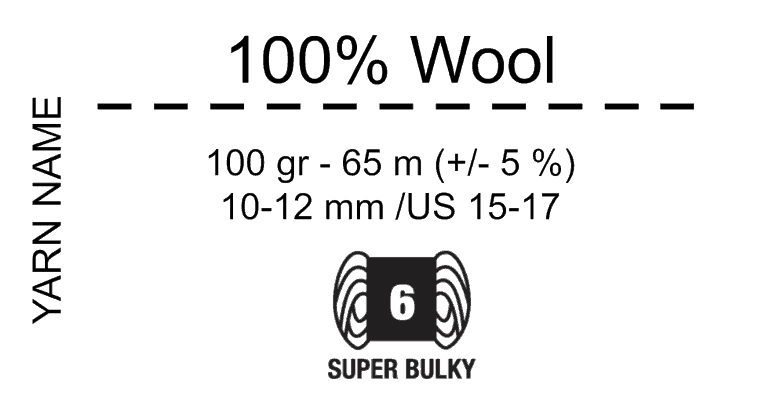 A illustration of the information given on a skein of yarn. Related: Learn more about gauge. Also related: Yarn weights: This encyclopedia is all you need. 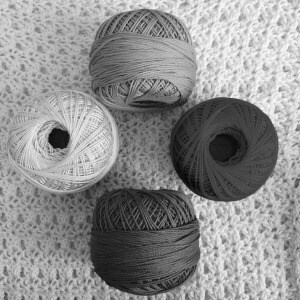 Resource: Changing yarn – see resources page. STEP 2: WHAT RESULT ARE YOU LOOKING FOR? Crochet hook in the same range as suggested for the yarn weight: “Normal finish”. Crochet hook smaller than suggested for the yarn weight: “Tight finish”. The crochet hook bigger than suggested for the yarn weight: “Lace/loose or stretchy finish”. When you are going to crochet something without a crochet pattern you have the freedom to do whatever you’d like. It`s like building something from scratch & there is few limits to what you can make. 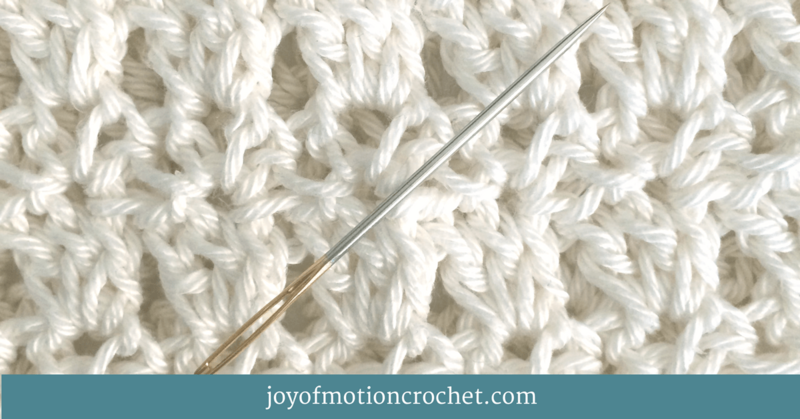 If you are new to crocheting on freehand, there might be a few trial and error before you know exactly what combination that gives you the best results. With enough test you will get the result you had in mind. Above you can see my “Summer Sweater” (picture above) that has used a bigger hook than the yarn suggests, & consequently the result was is a stretchy & lace fabric. This is great for many projects. The result from thicker yarn and thinner hooks is a much harder and stable finish as I said. This means there will be few or no holes in the result. This is more of a finish that I see in amigurumi crochet, where it is important with a tight result to keep the filling inside not peeking through. I find this also harder on the hands, because the hook will not slide as well along when it is as tight. Related: Ergonomic tips on how to choose crochet hooks. How tight or loose a your crochet result is, also depends on the yarn fiber. This means that there’s no all in one answer to what crochet hook is right for the yarn weight. When it comes to the yarn fiber, there is a big difference between mercerized cotton & some wool yarns. A general rule is that the mercerized cotton is more likely to make for a result that will widen & move more, especially with if you combine bigger hooks with thinner yarn. The opposite result you will have with thinner hooks & wool yarn – this will be more stable & stay in place. What I’ve found that with wool yarns & bigger crochet hooks is that it’s easier that the original shape will be kept more intact even after you’ve used what you made for a longer period, rather than when the same product is made with cotton. 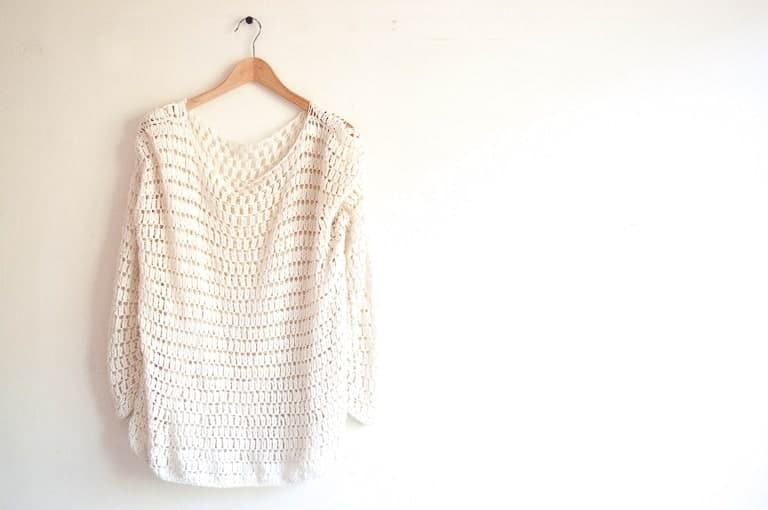 A great example is the summer sweater that was pictured above, but made with wool yarns. However for cotton sweaters (or other products) made with bigger hooks you can focus on keeping the shape by shaping it after it’s washed. Love your sight. Very helpful and informative.